In the run up to the first weekend festival of the year, HRH Metal, Über Rock’s crack team of dedicated writers are endeavouring to catch up with as many bands as possible who will be playing this amazing metal extravaganza. This time around, we meet up with Nick Adamson, guitarist with Lancaster-based Bloodyard, who takes time out of his hectic schedule to sit and have a brew with us at Über Rock HQ who tells us all about the bands plans for 2019! I started by asking him if anyone in the band had been sticking to any resolutions they made? If so, what were they? Ha, no, no new year’s resolutions really, just the usual take better care of ourselves, and keep working hard. You’re kicking off the new year playing the magnificent HRH Metal! What is it about your band that makes you a strong candidate for this music festival? Yeah, we can’t wait, it’s going to be awesome! I think what makes us a good candidate for an event like this is the same core idea we had when we put the band together, and that’s to play fun music that you can rock out to. That’s what these kind of festivals and shows are all about. You can go and watch a band on their own tours and want to see your personal favourites and see them really express themselves. But when you come to an event like HRH Metal you want to see as many bands as possible playing the absolute bangers, and that’s what we’re all about. We want to see everyone up, banging their heads and enjoying themselves. How do you guys warm up before an event like this? In the weeks running up to HRH Metal we’ll really knuckle down in the rehearsal room. We had a few weeks off over Christmas but we’re back on it now and putting some serious work in. On the day itself it’s mostly about making sure you’re prepared. We’ll have a look around early in the day and watch a couple of bands and get ourselves in the mood. Then its head to the dressing run, have ten minutes or so to loosen up the limbs and get ready to go on stage. What can we expect from you at this event, any new songs? You can expect a bit of everything from us during this set. With us currently working on our album there will be a few new songs getting an airing, and see how they go down with the audience. On top of that we’ve recently been having a run through some of our older material and really enjoying that, so you can expect to see some of those too. We want to put together a high tempo set that is full of energy. We hope to see people right at the front and really enjoying themselves. When coming up with new music do you all collaborate, what is the band’s process? Oh, it’s definitely a collaborative effort! I usually come to rehearsal with a few riffs and a general outline of a song. Once I’ve shown it to Dave, Donna, and Matty they will stretch it, twist it and mould it, putting their own ideas in to it and moulding it in to complete song. Very rarely has a song ended up sounding how I imagined in the beginning, but I’m yet to be disappointed. Do you all get together to rehearse at weekends in order to tighten your performance for events like this? Yes, we rehearse every week at our local Music Co-Op. We’ve always thought that one of the best things about being in the band is the fact that we genuinely enjoy hanging out together and getting together for rehearsals is a big part of that. Rehearsal day is always my favourite day of the week, and as well as all the work we put in to the music, we have such a laugh. When at big festivals do you think it’s important to engage with your fans after the show rather than just interacting on social media? Definitely! These are the people that are coming to the shows, buying the music and merchandise and without them we wouldn’t be there in the first place. Social media is great for keeping people updated with everything to do with the band, and you can have some really good interactions on there too. But we love hanging out with our fans and we’re always up for a pint after a show, and Donna will literally talk to anyone! You guys are currently recording your debut album, how’s that going? It’s going brilliantly! The best thing about working with Daryl (at Lancaster and Morecambe College Studio) and Chris, is that we can really take our time with everything and make sure what’s getting recorded is the absolute best of Bloodyard. So far all the drums are done, and about 90 per cent of the guitars are complete. Now we’re past the festive period we’ll look at when we can get the Bass lines down and finish of the guitars, then it’ll be Donna’s turn in the vocal booth. We see your releasing a double EP in time for HRH Metal, can we expect some skull crushing riffs on this? Yes, yes you can! What we decided to do in the run up to HRH Metal is take the two EPs we’ve previously released, ‘Set to Fall’ and ‘Darker Rage’, and put all eight songs on one CD. We’ve put the front and back artworks on there too. It’s a bit like re-watching old episodes of your favourite TV show in preparation of the new season! Sounds awesome, I will have to grab a copy when I see you down in Birmingham! We heard you will be doing a live stream of some songs you rarely get to play, when can we expect this: I don’t want to miss it! Yeah, we’re really looking forward to this too! When we were putting things together for the double EP we realised that there are songs on there that we haven’t played live for some time because we just can’t fit them in to the set these days. We had a few runs through at rehearsal and these songs are still really good fun to play. So we thought we’d invite everyone behind the scenes so they can enjoy these songs with us, and get to see what we get up to in the rehearsal room. It’s the first time we’ve done anything like this, so we’re really excited and hopefully we can do more of them in the future. We’ll be doing the live stream this coming Tuesday (22 January), at around 8:30pm. Awesome. I must put that in my diary so I don’t forget! When putting the band together what strong personal qualities were you looking for in your band members? What was really important to us was the personal compatibility, the work rate, and the passion for music. We spend hours at a time in a small room together, hours at a time in a car or van, and even on some occasions hotel rooms and tents! If you don’t get on on a personal level those situations can be really tricky. As well as that it’s about everyone working together and pulling in the same direction. We love what we do, and as much as we’re playing for the fans when we’re on stage we’re playing for each other too. I love looking across the stage during a show and seeing Donna smiling, Dave rocking out, and Matty laughing behind the kit, that for me is what it is all about. Weirdly musical ability comes after all that. It doesn’t matter if you can play guitar like Steve Vai, or drums like Gene Hoglan, if there isn’t that chemistry there it’s a chore rather than a passion. Do you think events such as battles of the bands are important for new up and coming bands? I think they can be yeah, it all depends on how you approach them. 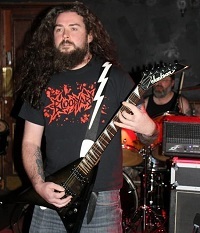 When we did Metal to the Masses in Burnley, we did it to start with as a way to get more gigs in that area. We’d just played a gig at Sanctuary and had a really good time, so we figured it would be a cool place to do it. Battle of the bands competitions can be good for up and coming bands because you have to learn how to be prepared, punctual, and professional. It’s very important with those kind of events to present yourselves as an efficient unit. When I was a judge for the Burnley Metal to The Masses I paid as much attention to how bands conducted themselves getting on and off stage too. Music can be very subjective, and there are lots of amazing bands, so sometimes it can come down to who got set up within the allotted change over times and such. The main thing with these competitions is to get the balance right between taking it seriously, but not pinning all your hopes on winning. They can be a great way to meet new bands and people within the industry, and be a fantastic way of taking that next step as a band, but no one becomes famous because they won a battle of the bands. Do you find it easy to juggle your time with the band and your personal time? It can be tricky sometimes, what with work, childcare, and other commitments. We always try to make sure we keep each other updated as to when we aren’t available, so that we can work gigs and stuff around it. But at the end of the day, playing music is a priority for us, so we all make our sacrifices. Outside of music what do you get up to in your personal time? Any hobbies? To be honest the one of us that has the most notable hobby outside of the band is Donna, She’s vice-captain of the hockey team. They’re doing really well this season sitting at the top of the league! Ah, no way, I love hockey! What is lined up for the rest of the year for Bloodyard? We start the year off with HRH Metal, then it will be a matter of getting the album finished and all the promo going for that. Then it will be getting back out on the road and gigging. We’ve got Thrashersaurus festival in May, down in Norwich, so we’re planning a few gigs to tie in with that and get us down south for a show or two. We’re hoping to get a few more festival dates to build around and send plenty of time getting out and about playing shows. Finally, is there anything you’d like to say to your fans? Just a huge thank you! The fans support makes all of the hard work, the late nights, the long drives, and the hours and hours in a small rehearsal room all worth it. Without having our amazing fans we’d still be sat at home wishing our lives away, but instead we get to come out and play for them, and genuinely have the time of our lives doing it! 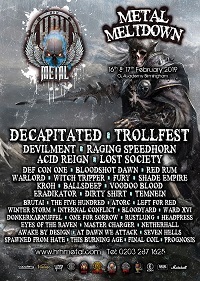 HRH Metal takes place at the O2 Academy in Birmingham on 16 and 17 February. Photo of Nick Adamson by Robert Hacker/Mad Hacker Photos. All content © Über Rock. Not to be reproduced in part or in whole without the express written permission of Über Rock.